Create a PuzzlesPrint Photo Collage - When Just One Photo Isn’t Enough! PuzzlesPrint helps you turn your personal photos and images into jigsaw puzzle gifts. But what if just one picture on the puzzle isn’t enough? We can turn more than one picture into a memorable photo collage jigsaw puzzle! When planning a special gift to commemorate a special occasion, choose a photo collage jigsaw puzzle from PuzzlesPrint to make that gift truly memorable. To start creating your photo collage jigsaw puzzle select jigsaw size, collage template and upload your photos! PuzzlesPrint offers you to choose a photo collage layout with a background! To order a photo collage jigsaw you need to select photo jigsaw size and one of our provided photo collage layouts. Each one is with a different background image, you can select the best one that matches the occasion or images that you will use for the photo collage. When you have selected the jigsaw puzzle size and the right photo collage layout, just upload an image for each field, you can re-position the image after you have uploaded it. You can also add text to your photo collage to make it even more personalised! Your photo collage will be printed exactly as you have designed it on our website, no changes will be made. 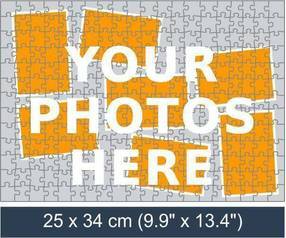 Price for the collage jigsaw puzzle include the photo collage layout. Your photo collage jigsaw puzzle will be a beautiful and stunning image AND a special puzzle that your friends and family will want to assemble over and over again for years. Photo collage puzzles bring out the fun and the memories! Just like our other personalised photo jigsaw options, photo collage puzzles allow you to use your pictures to create memorable gifts to commemorate important moments and events in your life. You may be planning a special surprise for a family reunion, or a gift to celebrate a reunion of dear friends, classmates, or colleagues. What makes this puzzle gift truly special is that it incorporates a group of the pictures most meaningful to you and your recipients into one stunning keepsake photo jigsaw. PuzzlesPrint uses the highest quality materials and best techniques to produce every photo collage jigsaw puzzle. Die cut for crisp and clean puzzle piece edges, images are produced for beauty and clarity. Photo collage jigsaw puzzles made by PuzzlesPrint are beautiful, sure to please givers and recipients alike.